You are browsing the archive for 2019 March 03. 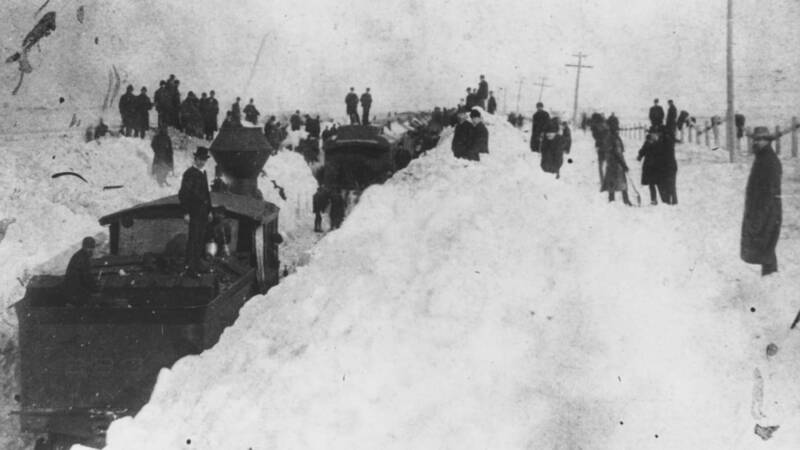 View of several people and a train stopped on snow-covered tracks after the great blizzard of 1886. This photograph was taken in Ford County, Kansas. As the stage coach drove up to Camp Supply, its passengers must have felt relieved. They’d been caught in a storm, and the coach’s horses had lost their path in the Kansas snow. Finally, the coach arrived at Camp Supply, a military outpost in Indian Territory in what is now Oklahoma. When the passengers got out of the coach, they realized they were many miles away from their original destination—and that they’d been riding in a coach without a driver. He was still sitting on top of the coach. His stiff, frozen body, that is. As the passengers had huddled for warmth inside the bumpy stage coach, he had died in the storm. It was January 1886, and the passengers had just lived through the worst blizzard Kansas had ever seen. Trains filled with hogs had frozen solid, along with their living cargo, as they sat idle, prevented from moving forward by drifting snow. People who had been outdoors on the prairie when the storm struck were found frozen, killed while searching for shelter. And then there were the cows—more than 100,000 of them, dead in the storm. All in all, the January 1886 blizzard killed at least 100 people and wiped out about 75 percent of the state’s livestock. The first indicators that there might be a monster storm in the works came not with snowflakes, but high temperatures. Previous winters had been mild, and late December had been warm, too. But on December 31, 1885, settlers noticed a strange purple-yellow color on the horizon, and soon temperatures were plummeting. Rain quickly turned to fierce winds, driving snow and sub-zero temperatures. Between January 1 and 3, Kansas experienced 36 hours of continuous blizzard conditions. Then, a second, even more severe storm developed. On January 7, the temperature plummeted even further, with wind chills of up to 40 below zero. supporting a border wall and give him leverage to end the shutdown. pot, customers prefer to buy American. and drug smuggling, the problems will continue. and even airplanes to compete with the traffickers.